Preheat oven to 350 degrees F. Oil 4-5 silicone liners and set aside. in a medium sized bowl, combine ingredients to make cupcake batter and mix until combined. scoop batter into cupcake liners and bake ~15 minutes or until cooked all the way through. set aside to cool while you prepare the frosting. in a small bowl, combine greek yogurt with protein powder and mix until smooth and creamy. scoop into a plastic bag with the tip cut off and set aside. flatten the tops of the cupcakes a little so they are even then scoop out the center of each cupcake. pipe the frosting into the center of each cupcake. top off with a drizzle of chocolate sauce (baking cocoa + water) and homemade chocolate pb cups. to make pb cups, i melted chocolate into the bottom of a cupcake liner, topped with @nutsnmore toffee pb, set in freezer for a few min, then topped with more melted chocolate. 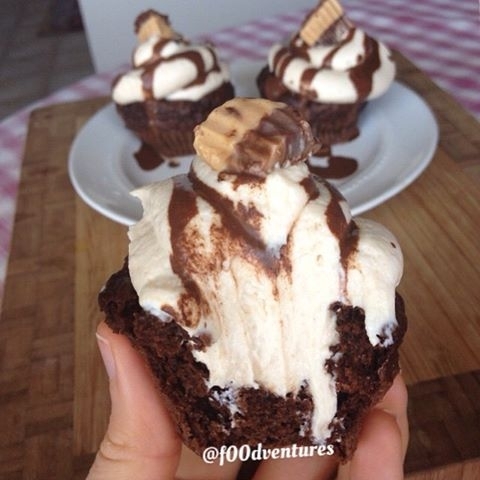 broke the pb cup into a couple pieces and topped each cupcake with a piece.